Update: Lilly Handmade Chocolates has moved to 2032 W Schaaf Road in Old Brooklyn. 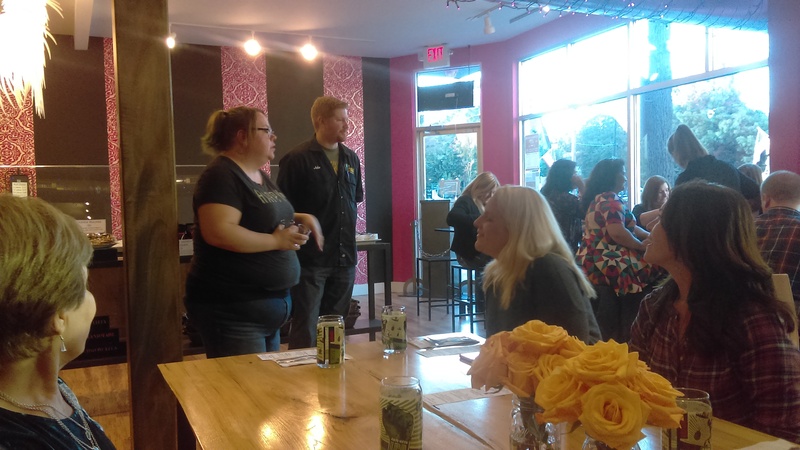 The storefront is smaller, with no seating, but they may pair up with another venue with seating for their tastings in the future. They are focusing on making lots of other chocolate delights in addition to their truffles. 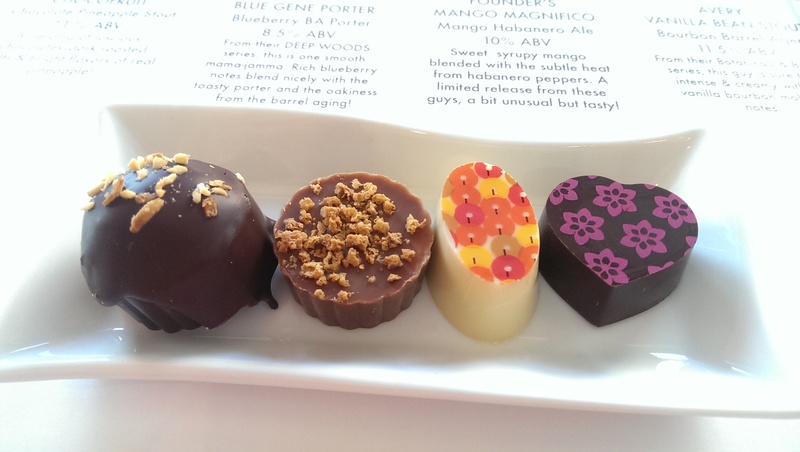 The chocolates here are expensive, but they are handcrafted and so worth it. You will savor every bite. You will pay $2.25 each for a piece of chocolate and can buy a box of 6 for $13 and 12 for $25. Each one packs a tasty wallop, whether it’s rich Valrhona chocolate or fine Swiss white chocolate featuring cinnamon, lime, hazelnut, bourbon or passion fruit. I am not normally a fan of white chocolates, but the Frou-Frou and Maui Wowie truffles are among my absolute favorites. You can buy their chocolate in truffle, bar, bark and seasonal forms. The truffles are gorgeous – each with a distinctive hand-painted decoration. Some of the truffles are mainstays, but some change at whim or with the season. When it comes to seasonal chocolate, their Dreamsicle Bark is the stuff of dreams in the summer and their drinking chocolate has a spicy kick to it that will warm you up in the winter. They also have a liquor license now, so they can offer cocktails with their chocolates. I can recommend the Fruit Cocktail. It tastes just like a fruit cup. And who doesn’t enjoy a boozy ice cream float even in the winter? You can check out their cocktail menu here. I started coming here to buy the chocolates, but I am now the Mayor on Swarm because of their special events. Amanda and Josh and all of their employees are super friendly and welcoming, and Amanda has one of the best palates I have ever seen in action. 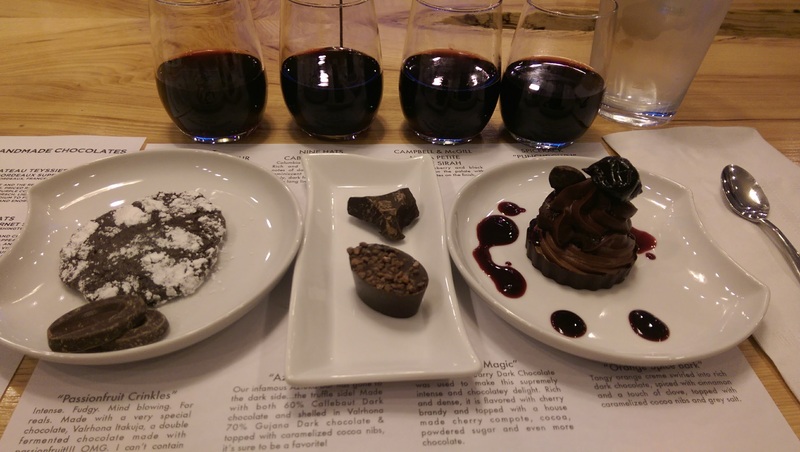 She can bring out flavors in beer or wine that pair perfectly with her amazing chocolates or mousse. OMG, the mousse! 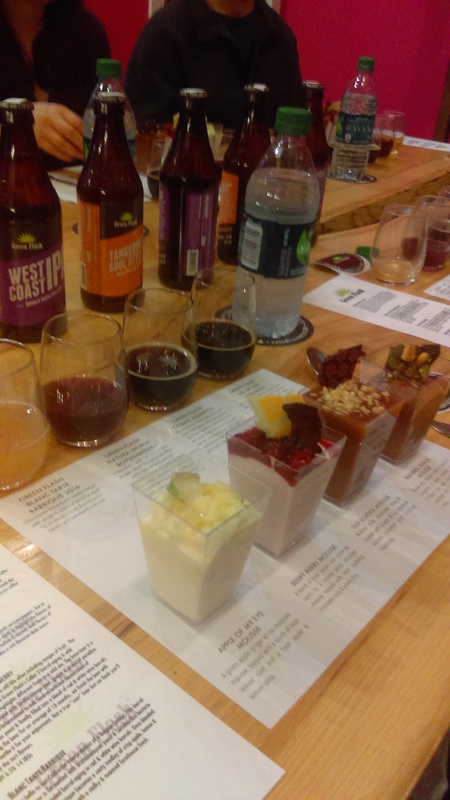 I have been there for the beer and mousse tasting, beer and chocolate pairings during Beer Week, beer, cheese and chocolate pairings, deep dark chocolates and deep dark reds pairing, and their anniversary mousse. I have never left disappointed or unhappy. The wine or beer distributors are sometimes here to explain their product, and sometimes Amanda announces what we are about to eat and drink and why she chose what she did. She always explains that you should take a sip of the beverage and then nibble the chocolate to experience the pairing taste sensation. The products are usually available for purchase after the event. I have been turned on to some great wines and beers because of these events. I usually can find a parking spot in front of the store, but if no spots are available there is a big parking lot behind the building. So whether you are looking for a special gift or a special night out, be sure to keep Lilly Handmade Chocolates in mind!